... I failed horribly at not spending money. 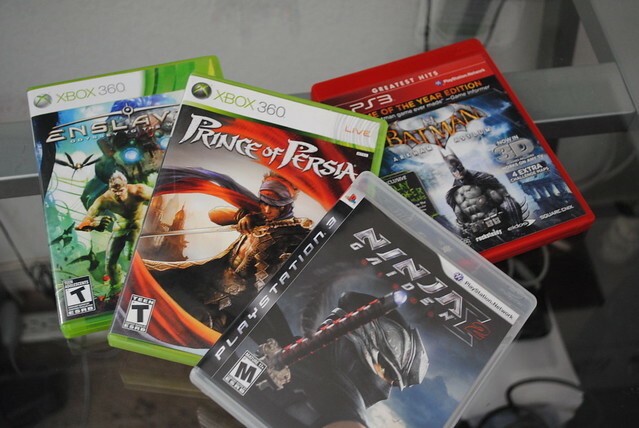 Then again it has been a couple of months since my last loot so stuff did pile up. 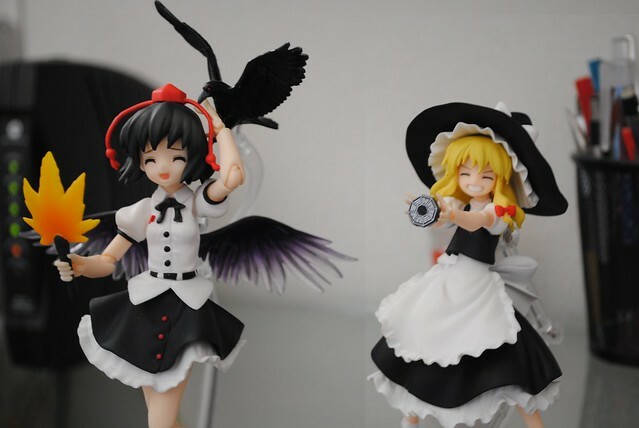 On the figure side I got a couple of Touhou girls. Hopefully you still remember Aya's lovely intro with that "special report" of hers. Speaking of which that sequel I had planed is way over due by now. After hoping to buy her for almost a year I'm overjoyed to finally own Marisa and look forward to taking several pictures featuring her like last time. 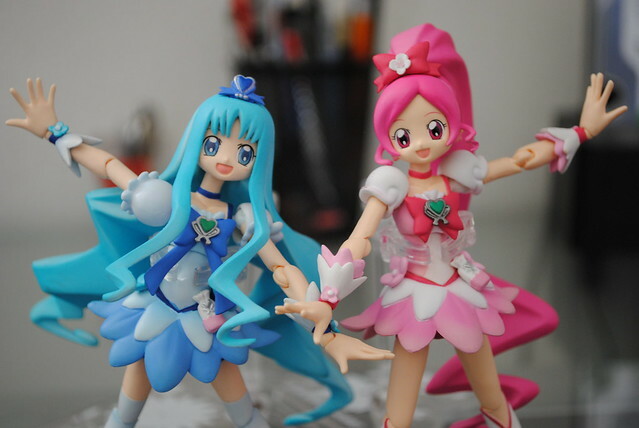 Did I mention I'm a pretty big Precure fan? While the original pair is what got me into the franchise and love those two, it's Heartcatch Precure that became my favorite show. Heartcatch is what you get when someone goes all out when making a Precure show. I mean just look at the transformation sequence, so awesome. That 100th post I was planning was gonna feature them but alas, a shipping delay threw that out the window. Not bother, I will just make that post in the near future. 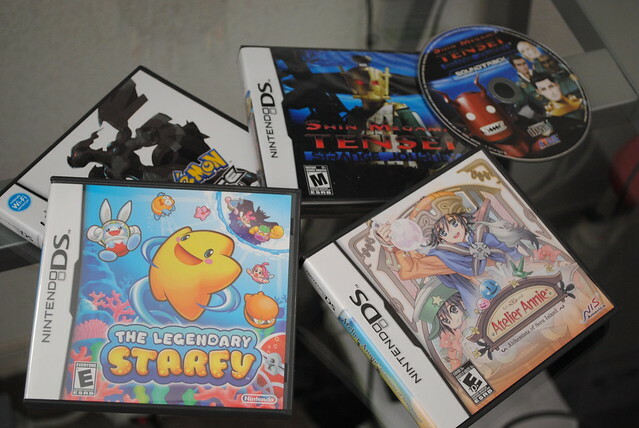 There was a sale recently with everybody's "favorite" game retailer and picked up a few titles I wanted for a while for cheap. Picked up a couple of NISA published RPGS. 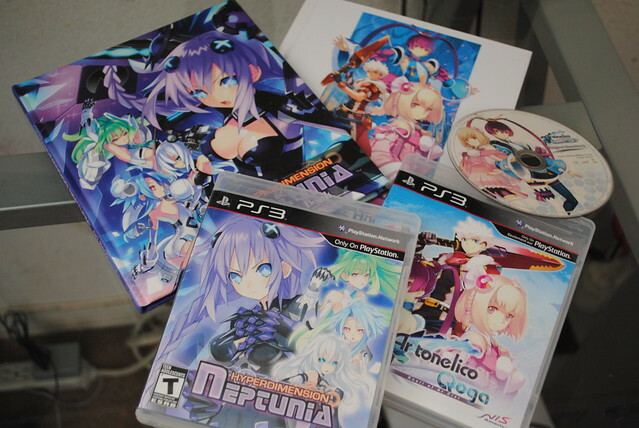 I picked up Neptunia based solely in it's premise and pretty characters. An anthropomorphizing of the current console wars, quirky RPG genre savvy characters, moesome girls, and a boat load of gaming references. Sadly enough this game wont blow anyone away, enjoyable for me but it does have it's share of problems. Also picked Ar tonelico 3, I heard positive opinions about the series so I thought to give it a try. Picked Ar tonelico 2, while not necessary I did read playing the previous Ar tonelico games would increase my enjoyment of the third. Still need to get a hold of the first. Finally managed to find a copy of Yakuza 2, I look forward to playing it so I can finally play Yakuza 3 and 4. Bought Breakdown an FPS, by Namco, for the original Xbox. There was probably a really interesting reason why I wanted to buy this, that reason escapes me right now. 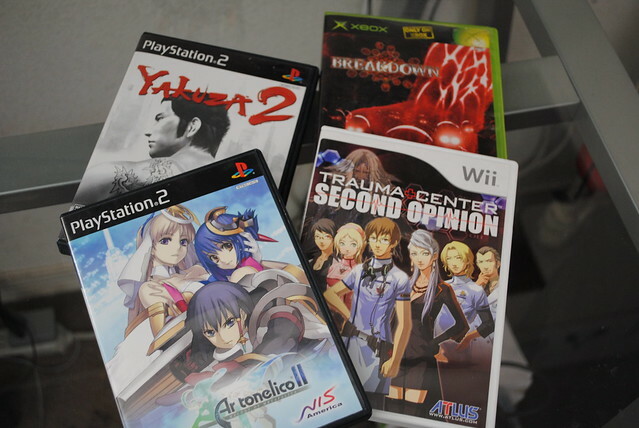 Lastly, bought Trauma Center Second Opinion, a remake of the original on the DS. I'm hoping the Wii version has a toned difficulty as I was never able to finish the original. 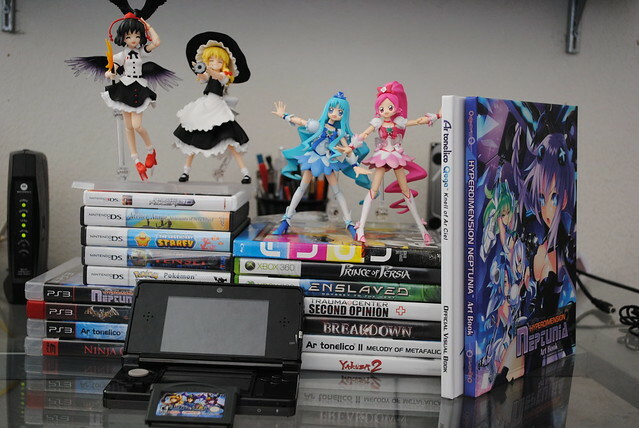 On the hand held side it's all DS titles. Bought Pokemon White, I wonder why thought. I just don't have the same drive as a kid to finish a Pokemon game anymore. Just Diamond took me four years and over 80 game play hours. Who knows how long Soul Silver will and when will I get to White. Picked up Atelier Annie pretty much on a comment made by Radiant about it. Starfy a Kirby like platformer I been curious about for a while too. After Persona 3 and 4 made me an Atlus fan I been wanting to play their more typical RPG experience of which Strange Journey is a perfect example. The game comes bundled in with a soundtrack CD which is pretty nice. 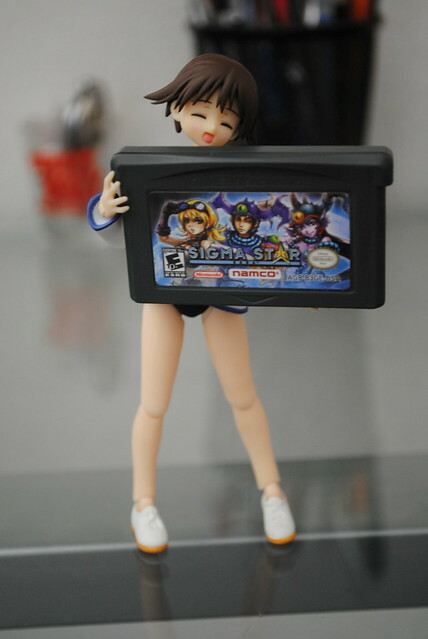 Got myself Sigma Star Saga from the good folks at Wayforward. A unique mix of an RPG and a shmup. Now that I finally got a job, one of the things that I want to do is to get rid of my fansubs and replace them by their licensed releases where applicable. 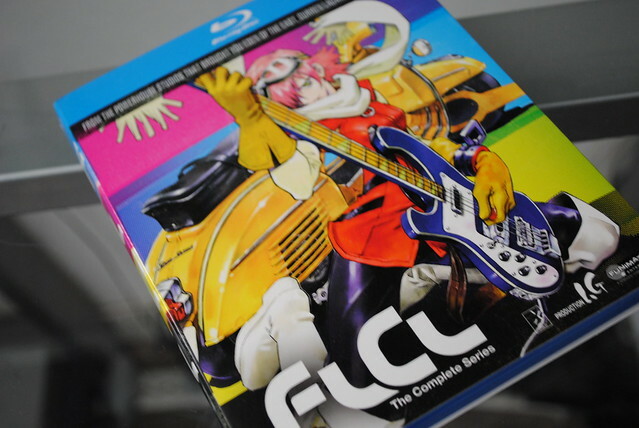 To start off I went with the always awesome FLCL, the blu ray looks great. 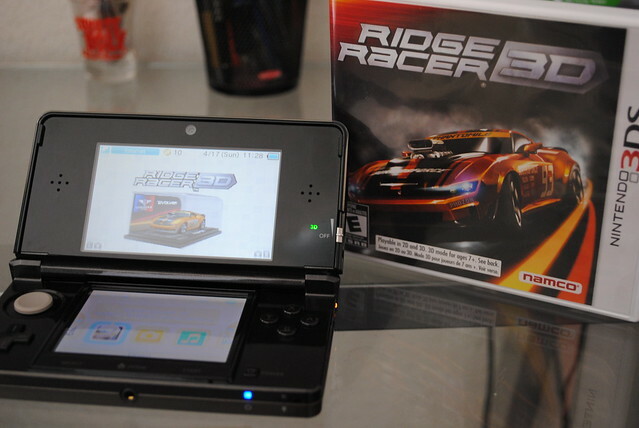 The best for last, I splurged and bought a 3DS. If you own one and want to do a friend code exchange I would be more than happy. I would be feeling pretty miserable at the amount of money I spend in a couple of months if it wasn't for the promise of a stable income. Yes, good thing for employment.